The next day at Zoe Moon Cosmetics, Pearl brings out this self-help book about men, reading that guys are available on every corner, which gives her hope. Zoe come in with coffee for everyone, even Miguel, which throws Pearl and Valente off since they know Zoe hasn't been Miguel's biggest fan. However, after the Atlantic City trip, Zoe states that she's actually inspired by Miguel's success story, and I think she might even have a bit of a crush now, though she says nothing to her crew. Miguel comes in at that moment, bringing in coffee for Zoe! Oh they're definitely going to have a romantic moment before the season's out! Pearl then asks Miguel where one should go to find a good man, still holding out hope on this wedding. Miguel states that she should go to church, and invites them to his. Looks like Pearl will be heading to the House of the Lord, though not for the right reason! That night, as Zoe walks back into her condo, she sees Xavier being interviewed for the documentary. Of course, she's irritated, especially seeing Ashley in her house, and tells Gemini to meet her on the terrace right now to discuss this. She goes off, still believing that smething happened with them in the past. Plus, she didn't get the memo or sign off on Xavier being recorded for the documentary. Gemini doesn't get why Zoe's all upset, feeling like she should be there for him after all he's done for her. Zoe admits that this is her fault, because she's allowed him to dominate over her a bit, but now she's checking him! In retaliation, Gemini calls her Stella St. James, revealing that he knows about her trip to Atlantic City and her little alter ego. Angrily, Zoe tells him to get the hell out, and to take that piece (Ashley) with him! Later, Pearl and Valente go to church to find some men! Zoe pops up too, planning to go off on Miguel, believing that he's the one who told Gemini about Atlantic City. When she sees Miguel, she goes in, stating that she was right about Miguel being hired to spy on her by Gemini to ultimately take down Zoe Moon Cosmetics! She sounds like a crazy woman, and, of course, Miguel has no idea what she's talking about. An elderly church member, Brother Hedgepath, comes over to flirt with Zoe, and Miguel leaves her behind to deal with him as payback! Meanwhile, Ashley goes to say goodbye to Gemini as he sits in the ring thinking about his argument with Zoe. He apologizes to her for the incident earlier, but Ashley admits that he expected it. He's clearly upset by Zoe's actions, thinking that they would still be together even if just as a family. Ashley tells him that she will be here for him whenever he wants to talk, and they kiss! Looks like Zoe was right about their chemistry after all! During the church service, Zoe switches seats with Pearl and Valente to get to Miguel. While Zoe hurls insults at him, the pastor introduces Miguel to the congregation, thanking him for all of the work he has put in for the church. Zoe thinks he does all of this just to get business for his company, but the man is actually a saint! After church, Pearl goes out with Brother Hedgepath, who apparently has a grandson who's 6'4 and a banker! Meanwhile Zoe confronts Miguel again, but Miguel didn't tell Gemini! Valente was the one who put the trip on Gemini's card, and had to explain who Stella St. James was to his accountant, who probably told Gemini. Miguel is sick of being caught in the middle of Zoe and Gemini's mess, and she apologizes. Miguel forgives her for today since they are in church and what not. 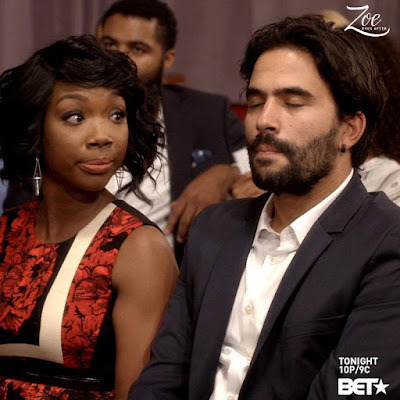 Zoe asks if she can take him out for an apology dinner, but he already has plans with another woman at the church. It's clear that, as Zoe watches him walk away with the girl, that she kind of wanted the date! Again, they're definitely hooking up before the season is over! Later, Xavier talks to Gemini on FaceTime, planning to watch the documentary with Zoe. However, in the documentary, Ashley also features another fighter Juarez who is going up against Gemini in a big fight. When Xavier asks if Gemini will be able to take him, Zoe, who doesn't really know what to say, does what she thinks a mother would do to change the subject: a pillow fight! The hour-long season finale of Zoe Ever After is next Wednesday, February 16 at 10 p.m. ET only on BET!